These days, outrageous is the way to go if a custom motorcycle has to grab attention in the best way possible. Mostly, it’s the design and the artistry which makes an enthusiast sit up and take notice. However, this particular handbuilt example is all heart. 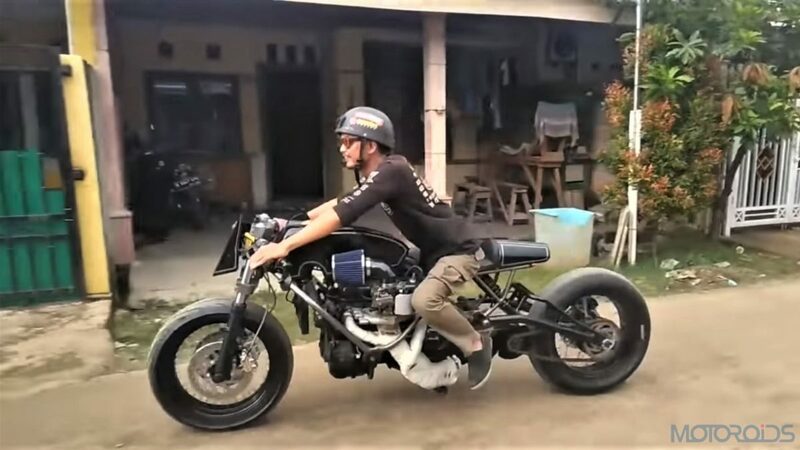 The work of Indonesia-based Bokor Customs, this motorcycle is powered by a Toyota Innova‘s (sold as the Kijang in Indonesia) 2.0-litre petrol engine! A true yard built specimen, the engine on the motorcycle has been mounted longitudinally, transferring its 136 something horses to the rear wheel via a chain. Body panels? Well, they only had to take care of a fuel tank, a rear cowl and a cover for the large-sized battery. Built around a tubular frame, for the way the engine has been bolted, this is an LWB motorcycle which runs on slicks for some reason. Still, telescopic forks, disc brakes and a monoshock at the rear do mean that this laugh riot can be ridden and isn’t just a showpiece for a biker build off. For how the rider laughs while being in the saddle though, we’re sure it must make the men behind this build really happy, but we also think their palms and digits did take a beating after operating a clutch which must be really hard to operate. What about the exhaust system? There’s just a tiny pipe which integrates all the outlets from the engine into one and interestingly, opens its mouth right in front of the left side footpeg. It does sound guttural though and is in line with the “logic goes to the bin” thought process behind this build. Even the channel on which the video has been hosted is called ‘Stupid Brother’! We think if they haven’t found a name for this contraption, yet, we’d like to suggest, “Mad Hatter”.